An Associated Press report from this past week demonstrates how plain facts and provable, documented historical events are often described as subjective perceptions and matters of perspective in the mainstream media whenever an honest presentation and assessment of those facts would serve to reduce the fear-mongering propaganda over Iran's nuclear energy program. Writing from Tehran on January 15, 2013, AP's Iran correspondent Ali Akbar Dareini reported that Iranian Foreign Ministry spokesman Ramin Mehmanparast had declared Iran's intention to register its long-stated (and officially binding binding) prohibition on nuclear weapons as a legally-recognized, secular, international document. "Mehmanparast could not be more definitive in dispelling suspicions that Iran may ultimately develop a nuclear weapon," Dareini wrote, before explaining that while Iran is confident that "any ambiguities or concerns" regarding its nuclear program can be addressed and resolved as long as "a structured approach" is first agreed upon. Iranians say they have a bitter memory of allowing IAEA inspections and providing replies on a long list of queries over its nuclear program in the past decade. Now, Tehran says such queries should not be revived or remain open-ended once the IAEA has verified them. Mehmanparast said Iran provided detailed explanations to IAEA questions on six outstanding issues in the past but instead of giving Iran a clean bill of health, the agency leveled new allegations on the basis of "alleged studies" provided by Iran's enemies. Iran uses that term to refer to a list of questions including a dispute at Parchin, a military site southeast of Tehran, where the agency suspects Iran ran explosive tests needed to set off a nuclear charge. Note the repeated use of the same basic construction: "Iranians say..." and "Tehran says..." and "Mehmanparast said..." and "Iran uses..." The statements made after this routine prefix are therefore presented as subjective declarations coming from Iran and are never qualified or substantiated as facts. In short, they are used as disclaimers, readily understood by a suspicious and ill-informed audience. The readers of this AP report are therefore intentionally left with the perception that these are simply Iranian contentions and therefore automatically suspect, dubious, disputed or otherwise easily dismissed; after all, the comments all came out of an Iranian government spokesman's mouth and the mainstream media (and politicians, of course) has spent decades training its readers to believe nothing the Iranian government says or does can be trusted. While Dareini writes that "Mehmanparast said Iran provided detailed explanations to IAEA questions on six outstanding issues in the past," he omits that this isn't just a claim made by the Iranian government. Amazingly, the "bitter memory" that Iranians have about cooperating with the IAEA inquiries only to receive international sanctions and more military threats from the world's most well-armed and aggressive states is not merely some crazy Persian fantasy! No, it actually happened. In August 2007, Iran and the IAEA agreed to a "Work Plan" which defined modalities and a timetable in order to "clarify the outstanding issues" in relation to Iran's nuclear program. With regard to the memorandum of understanding itself, IAEA Director General Mohammad ElBaradei pointed out at the time that although "these outstanding issues are the ones that have led to the lack of confidence, the crisis," he confirmed, "We have not come to see any undeclared activities or weaponization of their programme." This conclusion was reached after two years of Iran's voluntary implementation of the IAEA's Additional Protocol, including a complete suspension of its enrichment program, which allowed intrusive and unfettered access to Iranian facilities for its inspectors. Despite the constant allegations of nuclear weapons work, the IAEA has confirmed both that "[t]o date, there is no evidence that the previously undeclared nuclear material and activities referred to above were related to a nuclear weapons programme" and found that "all the declared nuclear material in Iran has been accounted for, and therefore such material is not diverted to prohibited activities." The IAEA has consistently reaffirmed this finding in each of its reports over the past decade. It too should be remembered that Iran only suspended its voluntary implementation of the Additional Protocol after the EU-3 (the UK, France, and Germany) failed to offer any substantive proposals and reneged on its agreement to acknowledge Iran's inalienable right to enrich uranium as part of a peaceful, safeguarded nuclear energy program. The proposal eventually brought to Iran by Western negotiators has been described as "vague on incentives and heavy on demands," and even dismissed by one EU diplomat as "a lot of gift wrapping around an empty box." In fact, it is clear that the EU-3 never had any intention of offering Iran anything substantive or allowing increased Iranian cooperation with the IAEA and the answering of the IAEA's questions to thwart their real goal of imposing more sanctions and forcing the abrogation of Iran's national right to a peaceful nuclear program. A cable from the U.S. Embassy in London from September 17, 2007, published by WikiLeaks, revealed that Antony Phillipson ("the UK's point person on Iran issues") warned his American counterparts that the IAEA was being "naive" about Iran's "nuclear weapons program" (emphasis added). "Do not let the IAEA timetable interfere with ours," he insisted, adding "that it was important to not permit the IAEA's workplan to slow down or interfere with the EU-3's own agenda. For instance, bowing to pressure to put off submission of a [new UN Security Council] resolution pending some IAEA report or visit would weaken our efforts." Regarding the Work Plan itself, it affirmed that the "[t]hese modalities cover all remaining issues and the Agency confirmed that there are no other remaining issues and ambiguities regarding Iran's past nuclear program and activities" and that that IAEA had "agreed to provide Iran with all remaining questions according to the above work plan. This means that after receiving the questions, no other questions are left. Iran will provide the Agency with the required clarifications and information." In October 2007, ElBaradei confirmed, "I have not received any information that there is a concrete active nuclear weapons program going on right now [in Iran]," adding, "Have we seen Iran having the nuclear material that can readily be used into a weapon? No. Have we seen an active weapons program? No." By February 2008, due to Iranian cooperation and efforts at transparency, ElBaradei was able to report, "We have managed to clarify all the remaining outstanding issues, including the most important issue, which is the scope and nature of Iran's enrichment programme" and the IAEA continued "to verify the non-diversion of declared nuclear material in Iran." Nevertheless, the so-called "alleged studies" - information provided to the IAEA by Western and Israeli intelligence agencies that accuses Iran of engaging in research regarding uranium conversion, high-explosives testing that could be linked to the creation of a nuclear-weapon trigger, and ballistic missile designs that might be capable of accommodating a nuclear warhead - remains the sole point of contention and is often pointed to by Iran alarmists and the mainstream press as evidence of Iranian duplicity and intransigence. 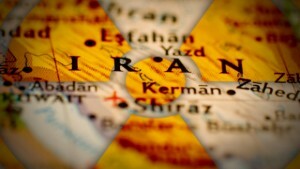 As Iran itself has repeatedly noted, according to the Work Plan, the IAEA was obligated to submit "all related documents" regarding these "alleged studies" to Iran and, in return, while reiterating its insistence that these accusations were "politically motivated and baseless," Iran would "review and inform the Agency of its assessment," which was acknowledged "as a sign of [Iran's] good will and cooperation." As per this agreement between Iran and the IAEA, "no visit, meeting, personal interview, [or] swipe sampling were foreseen for addressing this matter." Still, in yet another example of constantly moving goalposts, after Iran examined the documents it was allowed to see (far from the "all related documents" as promised in the Work Plan) and delivered a detailed "117-page assessment in which it asserted that the documentation was forged and fabricated," the IAEA dismissed the evaluation as being too "focused on form rather than substance" and "requested Iran to provide a substantive response." That Iran's assessment wasn't as substantive as the IAEA may have hoped is perhaps unsurprising considering that the IAEA didn't provide Iran with "all related documents" as required. In fact, the IAEA openly admitted to concealing most of the alleged documentation from Iran, claiming that it had "received much of this information only in electronic form and was not authorised to provide copies to Iran" and revealing that while "the Agency had been shown the documents that led it to these conclusions, it was not in possession of the documents and was therefore unfortunately unable to make them available to Iran." Furthermore, the IAEA itself "noted that the [IAEA] currently has no information – apart from the uranium metal document – on the actual design or manufacture by Iran of nuclear material components of a nuclear weapon or of certain other key components, such as initiators, or on related nuclear physics studies." The alleged "uranium metal document" referred to is identical to one produced by Pakistan, was neither commissioned nor requested by Iran and, along with other alleged documents, dates to "the late 1970s and early to mid-1980s." The IAEA also repeatedly emphasized that, despite all the allegations, "the Agency has not detected the use of nuclear material in connection with the alleged studies, nor does it have credible information in this regard" but still "urged Iran to engage actively with the Agency in a more detailed examination of the documents available about the alleged studies which the Agency has been authorized to show to Iran." The Agency has not delivered to Iran any official and authenticated document which contained documentary evidence related to Iran with regard to the Alleged Studies. The Government of the United States has not handed over original documents to the Agency since it does not in fact have any authenticated document and all it has are forged documents. The Agency didn't deliver any original documents to Iran and none of the documents and materials that were shown to Iran have authenticity and all proved to be fabricated, baseless allegations and false attributions to Iran. Iran has also wondered, "How can one make allegations against a country without provision of original documents with authenticity and ask the country concerned to prove its innocence or ask it to provide substantial explanations?" Absurdly, we were limited with regard to what documentation we permitted to show Iran. I constantly pressed the source of the information to allow us to share copies with Iran. How can I accuse a person, I asked, without revealing the accusations against him? The intelligence crowd refused, continuing to say they needed to protect their sources and methods. It should also be remembered that, in early 2007, an unnamed senior official at the IAEA revealed to the Los Angeles Times, "Since 2002, pretty much all the intelligence that's come to us [from the United States about the Iranian nuclear program] has proved to be wrong" and has never led to significant discoveries inside Iran. "They gave us a paper with a list of sites. [The inspectors] did some follow-up, they went to some military sites, but there was no sign of [banned nuclear] activities," the official told The Guardian. Additionally, the LA Times noted that "U.S. officials privately acknowledge that much of their evidence on Iran's nuclear plans and programs remains ambiguous, fragmented and difficult to prove." In an interview with Der Spiegel in April 2011, ElBaradei said bluntly, "I adhere strictly to the facts, and part of that is that the Americans and the Europeans withheld important documents and information from us. They weren't interested in a compromise with the government in Tehran, but regime change -- by any means necessary." A few months later, ElBaradei told The New Yorker, "During my time at the agency we haven't seen a shred of evidence that Iran has been weaponizing, in terms of building nuclear-weapons facilities and using enriched materials," before adding, "I don't believe Iran is a clear and present danger. All I see is the hype about the threat posed by Iran." This history of IAEA allegations and Iranian assessments is completely absent from the recent Associated Press report, leading readers to believe Iran is making claims that can't be backed up with evidence. Also, that reporter Dareini states that the "alleged studies" referred to by Mehmanparast is a term used by Iran "to refer to a list of questions including a dispute at Parchin," gives the distinct impression that this term is not an official one and that only Iran claims the studies in questions are merely "alleged" to have taken place rather than "proven," "corroborated," and "authenticated." But the term "alleged studies," is not an Iranian creation. Rather, that phrase is a construction of the IAEA itself; Iran didn't make it up. The first informal use of the term, referring to "topics which could have a military nuclear dimension" appears to be found in an IAEA Safeguards report on Iran from February 26, 2006. These "topics," purportedly revealed in documents taken from a mysterious stolen Laptop of Death, the authenticity of which has long been known to rest somewhere on the spectrum of dubious to fabricated, and which was provided to the IAEA by the United States by way of the MEK by way of the Mossad in late 2005; in fact, information gleaned from the laptop does not even contain any words such as nuclear or nuclear warhead. It is unsurprising, then, that IAEA chief ElBaradei once stated, "The IAEA is not making any judgment at all whether Iran even had weaponisation studies before because there is a major question of authenticity of the documents." The IAEA continued to use the term informally throughout 2006 and early 2007, before elevating the term to an official section heading in its August 30, 2007 report. It was subsequently used as such until May 26, 2008, when the more alarmist phrase "Possible Military Dimensions" superseded "Alleged Studies" in IAEA nomenclature. These allegations, unverified and long considered to have questionable authenticity by the IAEA's leadership, were suddenly resurrected and "assessed by the Agency to be, overall, credible," when Yukiya Amano (the America's man in Vienna who has proudly boasted of being, not an objective arbiter of truth and evidence, but as "solidly in the U.S. court on every key strategic decision") took over stewardship of the agency and began secretly meeting with White House and National Security Council officials before presenting biased IAEA reports on Iran. Back to the AP report: While Dareini notes that "Tehran has in the past allowed IAEA inspectors twice into Parchin," he fails to explain that because Parchin is not a nuclear facility, but rather a military complex not safeguarded by the IAEA, it is therefore off-limits legally to its inspectors. When Iran voluntarily allowed two rounds of inspections of Parchin by IAEA personnel in 2005, the agency revealed that its inspectors "did not observe any unusual activities in the buildings visited, and the results of the analysis of environmental samples did not indicate the presence of nuclear material at those locations." Regarding the current accusations centered around an alleged detonation chamber located at the site (a charge made in documents provided to the IAEA by Israel), nuclear expert and former IAEA inspector Robert Kelley has explained, "The IAEA is stretching its mandate to the limit in asking for access to a military site based on tenuous evidence." He recently told Bloomberg News, "The IAEA's authority is supposed to derive from its ability to independently analyze information. At Parchin, they appear to be merely echoing the intelligence and analysis of a few member states." Kelley has also called the Parchin impasse "a secondary issue" that is deliberately serving Israel and the West as "a distraction for the negotiations between Iran and the five permanent members of the United Nations Security Council plus Germany (the 'P5+1')." He adds (and explores in depth) that "the case for visiting the Parchin site—a matter on which the IAEA continues to insist—is not as clear-cut or compelling as some experts and officials portray it." It is undeniable that AP's Dareini is nowhere close to the propagandist that his colleague George Jahn is. Considering Jahn contributed "additional reporting" to Dareini's article, perhaps the problematic sections were his work. Regardless, for the Associated Press to omit crucial and easily accessible information from its characterizations of Iran's nuclear program is irresponsible and serves to continually misinformation (or under-inform) the public on the facts. And when facts aren't important, innuendo, allegations and demonization take over, inevitably setting the stage for something far more dangerous: an uncritical and unscrupulous press, aiding and abetting (wittingly or not) the dissemination of propaganda, dutifully presenting a manufactured justification for the supreme international crime, the initiation of (yet another) a war of aggression. The blatant disregard towards objectivity and truths in reports from western media particularly when it comes to issues related to Iran has complelled me to get my news from source other than western mainstream media. The MSM is backed by evil agenda driven criminals such as Murdoch, et al. Thanks for bringing the truths to the forefront. Your dilligence is much much appreciated.